A new twist is available for working with wafer paper- Chocolate! Instead of using baked cookies, you can use plain, chocolate candy bars from your local store. 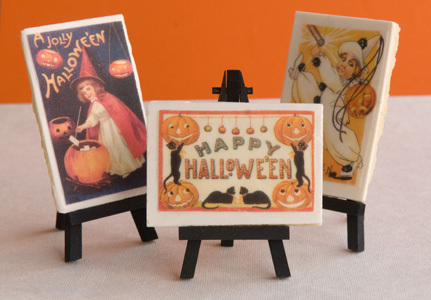 Our Vintage Halloween Wafer Paper Postcards are the perfect size for chocolate bars and make a really special Halloween treat! Kat Montgomery, maker of The Chocolate Addict, Chocolate Instructional DVD, has made a spook-tacular new instructional video for using wafer paper and chocolate. Check out the video below for the easy, make-it-yourself, new trend in treat making this Halloween! This entry was posted in Baking Inspiration, Chocolate, Halloween Baking, Instructions & How-To's and tagged chocolate, easy to make, Halloween Baking, treats, wafer paper by Fancy Flours. Bookmark the permalink. Actually my comment is in regard to how much I appreciate your fast service, the products you offer and how nicely they arrive at my doorstep. Absolutely the coolest how-to video ever made! !